A quick heads up that I have posted the presentations and lab materials from our recent SwitchYard workshops to our community space. So if you want to learn a bit more about SwitchYard or just really like to review presentation slides, head on over and check it out. The SwitchYard 0.2 release contained full JBoss AS6 and JBoss AS7 distributions i.e. modified AS6 and AS7 distributions containing the "bits" to allow it run SwitchYard applications. 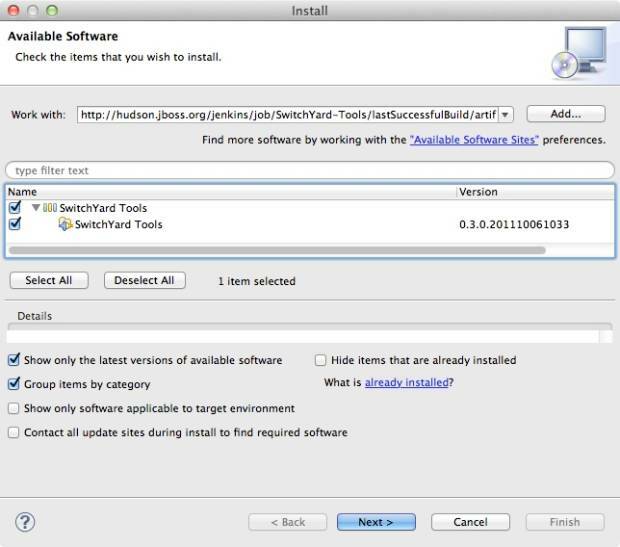 SwitchYard 0.3 will also contain a JBoss AS7 Installer, which will allow you to install SwitchYard into an existing JBoss AS7 instance. This installer is a simple .zip file containing an Ant script plus all the components for AS7. It reduces the download binary size quite a bit - 40M Vs 120M (for the full distribution), and we'll be reducing it more. The nightly builds can be found here. Just download the "SwitchYard-AS7-Installer.zip" file, unzip it and follow the instructions in the README.txt file. As Keith mentioned in his postSwitchYard Plugin for Eclipse, we have some initial Eclipse based tooling for SwitchYard (prototype may be a better word as the tooling is likely to evolve rapidly in the next few months). The tooling may be installed atop any standard Eclipse IDE for JEE distribution version 3.6 or later. You may use another type of distribution, but you will need to figure out which features need to be installed; at a minumum you will need XML tools and JEE project facets. Keith did a great job describing the installation steps, so I won't rehash them here. Creation of SwitchYard bean service classes. Creation of SwitchYard service unit test classes. XML catalog entries for all SwitchYard project schema. m2eclipse support for the SwitchYard Maven plugin. Support for workspace deployment of SwitchYard projects. The new project wizard creates a new maven project in your workspace whose pom contains the basic SwitchYard dependencies and build configuration. To create a new SwitchYard project, select SwitchYard Project. Press Finish and you'll have a new project ready for you to create some services. This wizard creates a new Java class with SwitchYard annotations that mark it as a bean service. In addition to creating the class, the pom may be updated to ensure the necessary dependencies are included in the project definition and to ensure that the SwitchYard Maven plugin is configured to scan for bean services. Press Finish and you should have a new Java class with a @Service annotation ready for coding. If you selected Create test class, you will also have a unit test ready to be implemented as well. Press Finish on the wizard and you've got a unit test ready to be implemented. Just initialize the test messages and add some validation and you're off! The tools provide very crude support for workspace deployments. SwitchYard projects created through the new wizard are created as faceted projects, configured as Utility Modules. This will allow you to mark the project for deployment to a JEE server. That said, it's up to you to ensure the server configured to deploy and run SwitchYard applications. At some point, we will have proper integration with the Eclipse Servers, allowing deployment only to servers supporting SwitchYard deployments. If you do not have the JBoss Maven repository configured in your workspace, you may not get a list of SwitchYard runtime versions in the new project wizard. The tools now configure a custom repository pointing to JBoss public. This will not alter the behavior of project poms, but will allow the JBoss repository to be scanned by tooling components. Rob has added a couple more features beyond the build lifecycle integration, so hopefully this will serve as bait for him to discuss them in greater detail. :-) Between Forge and JBDS, I think we have the foundation for a great tooling story in SwitchYard. Stay tuned.